Inspired by the traditional elegance of early 1900s American design, Bancroft brings a classic silhouette to the bathroom. This Bancroft bathroom sink faucet features two metal lever handles for precise temperature control, and a slightly curved spout with an aerator. Easy-to-install and leak-free UltraGlide(TM) valves and a pop-up drain and tailpiece complete the set. Redefine traditional styling with this Margaux bathroom sink faucet, which features a strong modern design that commands attention. This faucet comes with bold, ergonomic lever handles and Margaux's subtle pillow-top detailing. Outfitted with easy-to-install and leak-free UltraGlide(TM) valves, this faucet is designed for precision and reliability as well as style. Memoirs faucets with Stately design offer a refined elegance for your bath or powder room. Embodying the collection's sophisticated styling, this Memoirs bathroom sink faucet is outfitted with a classic spout and ergonomic Deco lever handles for easy operation. This faucet comes with easy-to-install and leak-free UltraGlide(TM) valves. A pop-up drain and tailpiece complete the set. Kelston(R) widespread bathroom sink faucet with lever handles Gracious and inviting, Kelston evokes the grandeur of traditional design while delivering outstanding performance. Water flows smoothly from the curved spout of this Kelston widespread sink faucet, while two ergonomic lever handles allow you to precisely control and maintain water pressure and temperature. This faucet is conveniently outfitted with easy-to-install and leak-free UltraGlide(TM) valves. 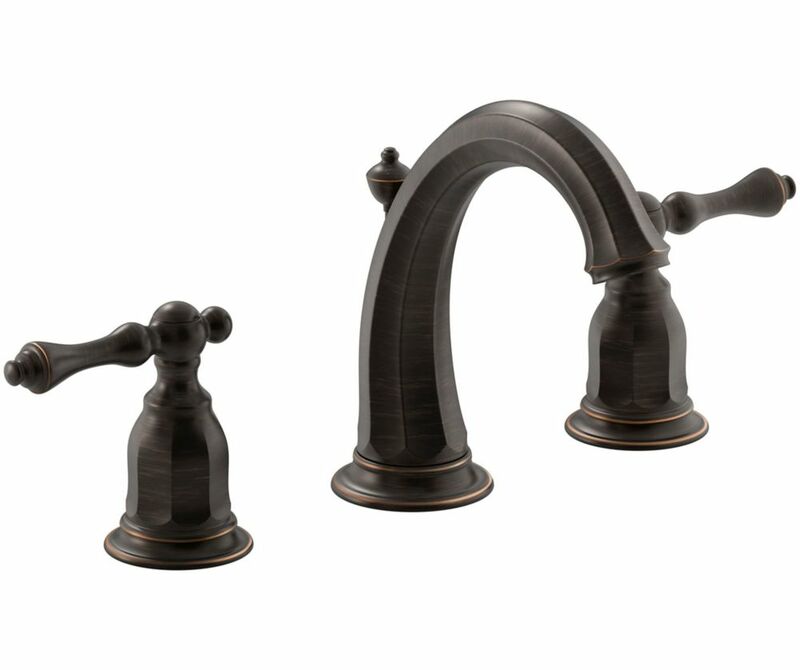 Kelston(R) widespread bathroom sink faucet with lever handles is rated 4.1 out of 5 by 9. Rated 1 out of 5 by Elaine from handles were fused into base and looked cheap. ... handles were fused into base and looked cheap. Rated 5 out of 5 by HomeDepotCustomer from This is the 3rd Kohler Kelston faucet I've purchased. Love the look and quality. This is the 3rd Kohler Kelston faucet I've purchased. Love the look and quality. Rated 5 out of 5 by Dobro from The faucets are pure quality. Bought two sets. You can always see the difference in Kohler prod... The faucets are pure quality. Bought two sets. You can always see the difference in Kohler products. Worth the extra $$$. Rated 5 out of 5 by RoRo from Easy assembly..directions ver clear. Make sure to lay out... Easy assembly..directions ver clear. Make sure to lay out all the parts first and take note that the circular base on the faucet is a separate that needs to be mounted separately before installing the faucet. Rated 5 out of 5 by shar from Yes, I am happy with the faucets, they look great with my granite countertop. Yes, I am happy with the faucets, they look great with my granite countertop. Rated 1 out of 5 by Buddy from Buyer Beware! Had these sink faucets installed in July 2015, and today, April 2016 noticed that the drain stopper's oil rubbed bronze finish is pealing off. CalledKohler customer service and they told me that as a "one time courtesy" they will send me another stopper. This should not have happened this soon. The customer service person told me that you cannot leave a bit of toothpaste or soap on stopper as it will ruin the finish. Who wipes the sink dry after each use? I have oil rubbed bronze sink faucets by Price Pfister in another bathroom that have been there over six years, and they never had this problem. I thought that I was getting a high quality product with the Kohler line....guess not! Rated 5 out of 5 by Ittibit from Love it! I can't say for the installation, since we did not do the installing. But this faucet is gorgeous. It looks perfect with our decor, a statement peice. It feels like quality.